I love Christmas as much as the next person, but it seems like every year, craft stores put out the holiday materials earlier and earlier. Just the other day I was at Michael’s and they had an aisle dedicated to Christmas ornaments already! It is absolutely crazy, but if you’re like me and have a strict budget, and just like to glitter everything on a daily basis, then you have to get started. I make hand-painted, homemade Christmas cards, so I have to get started early. I’m not quite sure when “Christmas in July” became such a trend, but it once it started, it has taken hold of July as a pre-season preparation. 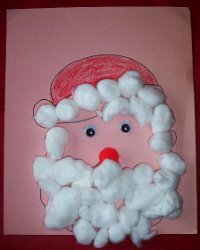 Christmas crafts have so many themes between a “White Winter Wonderland” to just the traditional colors of red and green. 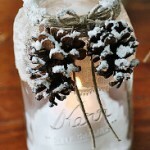 Since rustic crafting is still going strong, I wanted to focus on some rustic Christmas crafts. Crafting is the easy and cheap way to change your decor more often. With holidays, they tend to stick to typical themes. Fourth of July is obviously themed red, white, and blue; Halloween is black and orange with pumpkins everywhere and scary stuff, and Easter typically sticks with pastels. Christmas? Christmas is such a big holiday that you can do anything to your taste. I always like a lot of color in my apartment. 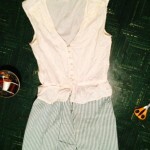 On a typical day, it has neutral colors with an accent color to make items pop. 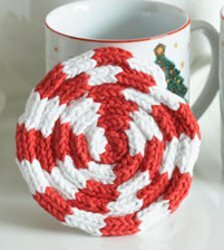 So when Christmas rolls around, it is easy to decorate because I just switch out the accent color for some cute DIY pillows and homemade centerpieces. All of these crafts would look fabulous together. What I love about rustic themes is that they use “natural” materials to make beautiful and classic decor. I use that lightly, only because you can make anything rustic-looking. 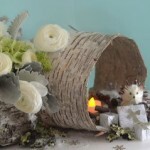 You always find burlap crafts and rustic weddings, but we need a rustic Christmas. If you’re already rocking the country home decor, then these will fit right into your home. 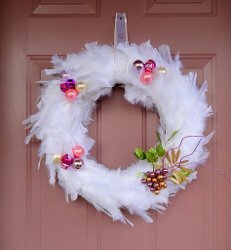 They are super easy Christmas crafts that can easily be put up and put away. My personal taste for Christmas decor? I grew up with the lights that had all the colors: red, green, yellow, some blue, and white. I feel those colors make my small space decorating just a little cozier, as long as I don’t go overboard on the decorations. Whatever is on my tree (usually those string of lights with the colors above) along with the general consensus of colors from my ornaments (my collection doesn’t have a theme—I’ve gotten a LOT since I was small), is the theme and color scheme that I choose. What is your typical theme for Christmas? What is a staple item that you center it around? Here is a fun and easy way to share the holiday spirit with friends and family. 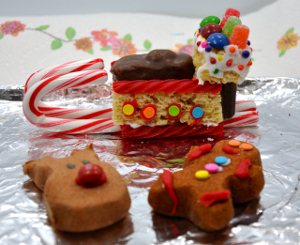 This project features adorable Christmas holiday PEEPS® treats on a candy sleigh. Using your favorite royal icing recipe (or purchase pre-mixed at cake supply store), mix up the royal icing. Split batch in half and add red food coloring to one batch and mix. 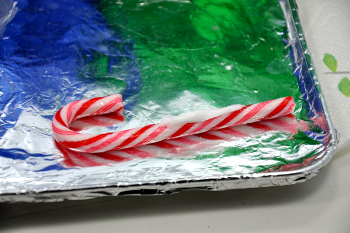 Place the icing in piping bags to use to build and decorate the sleigh. If you have egg sensitivities, you may wish to use melted white chocolate instead (make sure to follow manufacturers direction to properly melt chocolate). Before starting, make sure to unwrap all the candy to make the decorating process faster. Then using a piping bag, draw two lines of white royal icing on the rice crispy square. 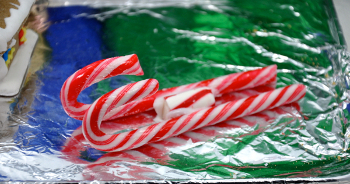 Lay the two candy canes on top of the Rice Krispies square equally spaced to create the base of the sleigh. Allow icing to dry. Once the icing has dried, turn the base over. Tthe Rice Krispies square should be facing up. 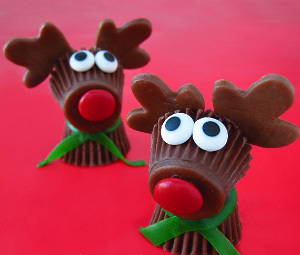 Take the PEEPS® Reindeer and using the red royal icing, attach a red skittle to his nose to make it bigger. Allow to dry. 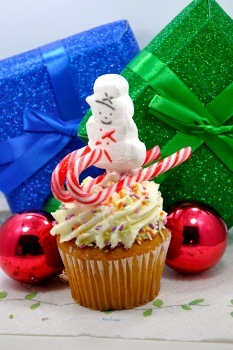 Take the PEEPS® Gingerbread Man and using both colors of the royal icing, add a few candy accents to add color to him. 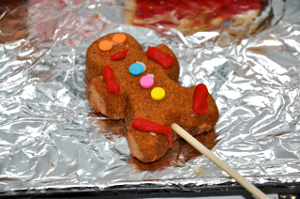 Use the red icing to make a line at his feet and hands. Don’t forget to put a little red icing on his mouth so you can see his smile. Once the icing dries, poke a toothpick into him to help support him (and hold him in place) when you put him onto the sleigh. 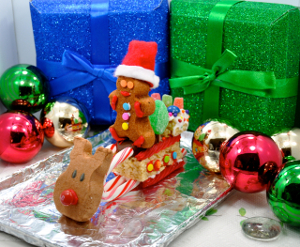 Using the two colors of royal icing, begin to attach some of the Christmas candy to decorate the sleigh. 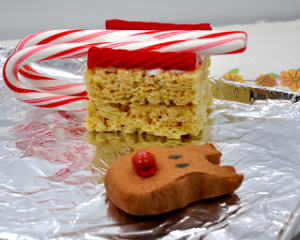 To finish, use the icing to attach the PEEPS® Reindeer to the front of the sleigh. Make sure to leave room for the PEEPS® Gingerbread man at the top of the sleigh. Remove the toothpick from the PEEPS® Gingerbread man. Use the toothpick to carefully push through the candy bar into the Rice Krispie square. It’s not even Thanksgiving yet, but holiday madness has started to descend. Have you started planning for Christmas yet, or are you too zeroed in on the big Thanksgiving feast? Department stores are already decorated for the holidays and shelves are prominently stocked with wrapping paper, gift bags, and all types of wintery decorations. Whether you’re excited and planning for Christmas already or waiting, AllFreeHolidayCrafts has you covered! At this time of the year I’m personally super excited for Thanksgiving; I have a small immediate family, so any time we get together is cherished. It also helps that everyone has an adorable dog they bring around. Dinner is potluck style, so everyone brings some sort of side dish to share and the biggest challenge of the night is how to fit everything on your plate during your first pass through the food. With full plates and fuller glasses, the entire evening just descends into laughter and puppy kisses. Despite having Thanksgiving on my mind, I know I’m starting to think about Christmas. There are plenty of gifts I’m planning on buying for my friends, but I also want to try my hand at making them some creative gifts. The holiday season is also prime baking time, so of course I have all sorts of chocolate-y recipes I want to try. To ease you into the Christmas mindset, here are some Christmas ideas. 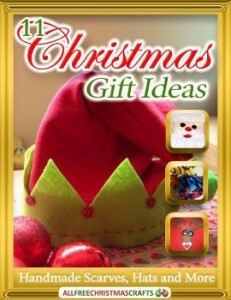 You’ll find patterns for Christmas-themed accessories, DIY Christmas gifts and decorations, and even some tasty, tasty recipes. For those that enjoy planning ahead and sending out some holiday cards, don’t worry; you’re covered, too. Keep the kiddos entertained this Christmas with these fun and festive crafts! 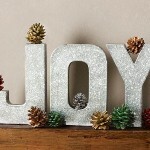 Decorate your holiday home with these fun and easy DIY ideas. 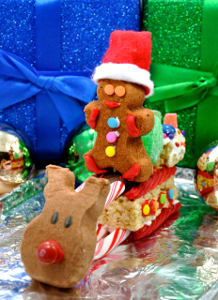 Savor the holidays with these delicious holiday treat ideas. Show your friends and family how much you care with these sentimental DIY gifts. If you still enjoy sending out holiday cards, here are a few DIY ideas. Are you looking ahead to Christmas yet? 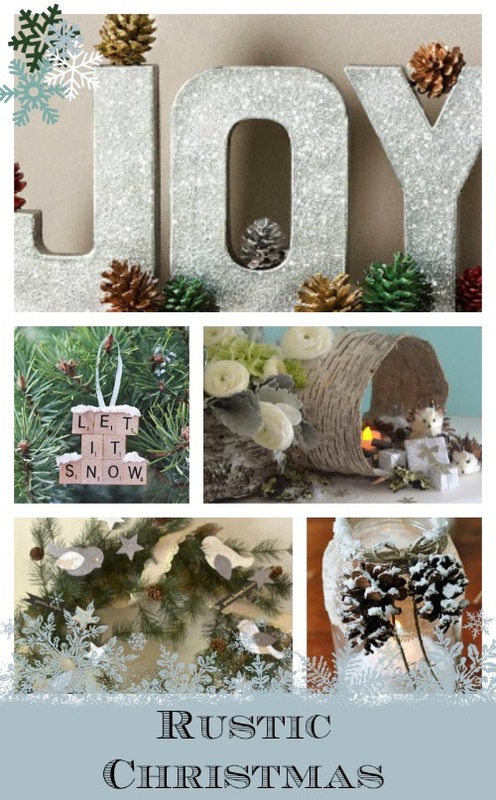 Beat the heat this July by planning ahead for the coolest months of the year, and get started on your early Christmas spree by browsing the 7 Secrets of Holiday Crafting, Part 1 and Part 2! While you’re getting ready, you can fuel your creative fire by checking out the Christmas Crafting Guide for some preliminary DIY Christmas planning. Penguins are one of my favorite animals, and penguin crafts are a great way to add my Christmas decorations. They are so cute, and since penguins are a winter animal, I can keep my penguin decorations up all season long. It keeps the Christmas spirit around all winter, and who doesn’t want Christmas to last longer? It’s the most wonderful time of the year! 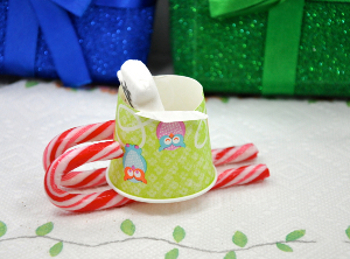 There are so many ways to add penguin crafts into your collection of DIY holiday decorations. 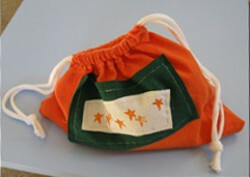 Penguins are a big favorite with kids, and most people describe penguin crafts as adorable or cute. Penguin crafts are sure to be a lovely addition to any holiday home decor. 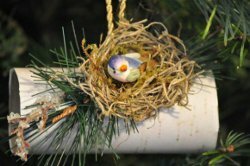 Start adding these precious animals into your collection of homemade decorations this holiday season with this list of fun, easy Christmas crafts complied by AllFreeChristmasCrafts. An easy way to incorporate penguins into your Christmas traditions this season is by putting penguins on your homemade gift tags like these Punched Paper Gift Toppers do. It is such a simple way use these adorable animals. You can also try out this Penguin Gift Tag by using a wooden tag and some paint to create a unique piece that’s a perfect way to top off any gift. Unique ornaments are the best way to make your tree stand out during the Christmas season. 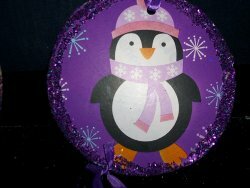 Take a break from red and green and try these awesome Purple Penguin Ornaments. If you want an easy Christmas craft to create with your kids, a Penguin Pals Ornament is for you; it can be completed in no time, and will look great hanging on your tree. Below are some additional examples of penguin Christmas ornaments you can make for the holidays. 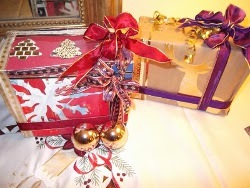 Creating homemade decorations out of recycled materials is an easy and inexpensive way to add to your Christmas decor. These Recycled Penguins are made out of liter soda bottles. You could also make these Skiing Penguin Buddies made out of fruit cups. What an adorable and crafty way to go green this Christmas! Haven’t quite found your favorite new penguin craft for Christmas? Try out these additional cute penguin crafts for your table top or mantel. 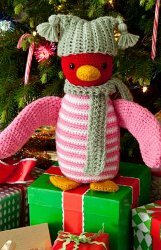 I love penguin crafts for Christmas, and I hope you do too! 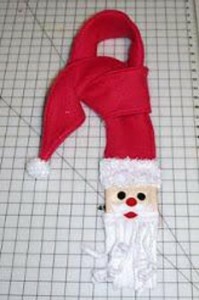 In addition to these adorable, fun Christmas crafts, go to AllFreeChristmasCrafts.com and to the AllFreeChristmasCrafts Pinterest Board throughout the season to see more penguin crafts. Enjoy adding penguins to your holiday decorations collection this Christmas! What is your favorite Christmas character? I absolutely love the summertime fun of taking day trips to the beach, tending to healthy flowers in the garden, and throwing outdoor BBQ parties. Yet, I also love Christmas cookies, bright red poinsettias, and making handmade quilted gifts for loved ones. Fortunately, I don’t have to pick between my favorite season and holiday — I can just combine them by making wonderfully festive Christmas in July quilt projects! Although the holidays aren’t for another 6 months, all of the editors FaveQuilts are already getting ready for this year’s Christmas quilting projects. Check out our list of our most loved decorative Christmas quilts that you need to get started on today. Creating your own Christmas-themed quilts for the kitchen is not only an easy way to save money, but also an easy way to add a burst of cheerful festivity to your home! 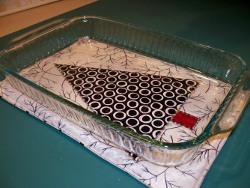 For example, this pattern idea for a Christmas Tree Hot Pad will come in handy when it’s time to take a Christmas ham or Christmas casserole out of the oven. If you have a few green and red layer cake fabrics handy, you can quickly piece together the multi-hued Christmas Joy Centerpiece to add a cute quilted Christmas decoration to any kitchen counter or dining room table. Personally, I like making minimalistic patterns for my quilted home decor; which is why I really love this extremely simple quilt pattern for this gorgeous Christmas Randot Table Runner. While palm trees are currently thriving in this July heat, nothing gives you that Christmastime cheer like imagining a gorgeous, decked-out Christmas tree. 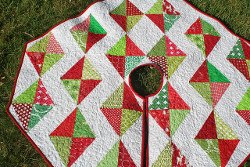 Your family’s evergreen will really stand out this year if you start making your quilted Christmas decorations, like the Christmas in July Tree Skirt, before Santa comes to town! If you’re tired of overly tinseled trees, you’ll enjoy the simple, but stunningly classic pattern for the Starry Christmas Ball Ornament. Don’t forget to make personalized Christmas quilt patterns for your kids or grandkids with the Scrappy Christmas Tree Stocking. Don’t let the holidays sneak up on you — prepare yourself for the most wonderful time of the year by making an advent calendar quilt or a wallhanging Christmas quilt. Some of FaveQuilts‘ all-time favorite patterns include the Christmas Traditions Advent Calendar and the Merry Christmas Wallhanging. 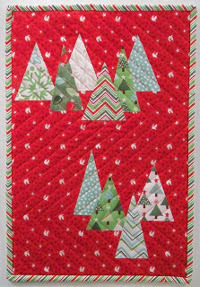 We also are pleased to bring you this NEW Christmas quilt pattern called the Christmas Tree Farm Wall Hanging, which features a whole forest of adorable and soft quilted evergreen pictures. 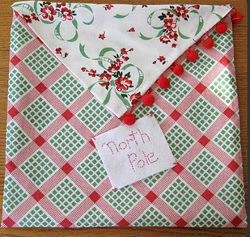 What types of Christmas quilts have you made in the past? By the time December rolls around, we usually aren’t thinking about green crafting. The weather outside simply forbids any notion of “green”. As Earth Week rolls around though, Little-Old-Me got to thinking that recycled crafts should be incorporated into Christmas. 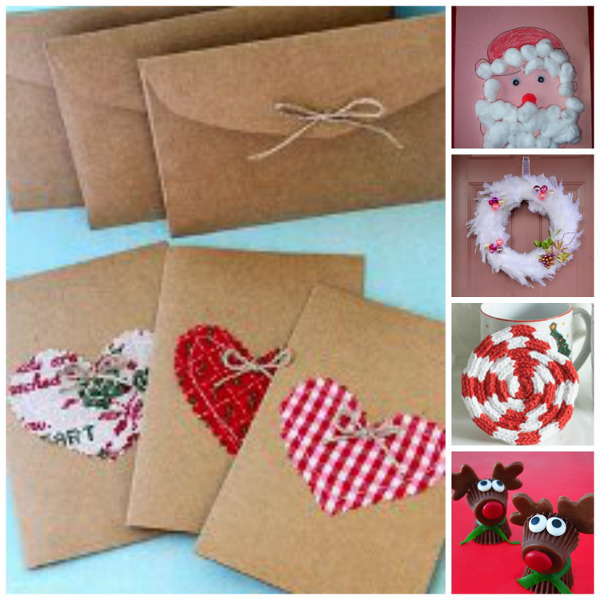 Here are a handful of recycled crafts to decorate or gift with this Christmas. I know what you’re thinking, “AllFreeChristmasCrafts, how can I be environmentally conscious when everyone and their second cousin is sending me Christmas cards and letters about their families that I’m obligated to keep for months?” Those cards certainly add up. Then they sit in a basket next to your couch before eventually being thrown away. Sometimes it’s easy to forget how creative you are. Take these Christmas Card Letters, for example. This is a Christmas card craft you can absolutely accomplish. Plus, you’ll love doing it. 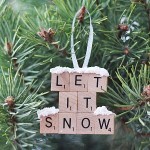 Select your favorite designs from your Christmas cards and scrapbook them onto wooden letters of your choice. I loved this idea from Mama Buzz. 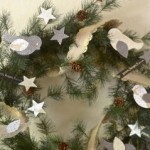 This is a great Christmas craft for kids that can be used all season long. 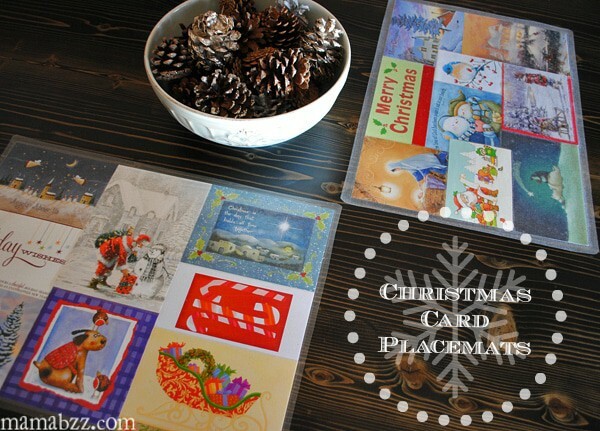 Use your Christmas cards to make Christmas Card Place Mats. They are easy to make and can be used year after year. 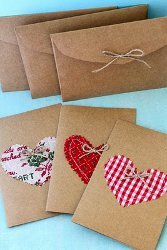 If you’re thinking that you have enough Christmas decorations in your house, another great idea is Wrapping From Recycled Cards. When you think about it, it’s silly to buy pricey wrapping paper that’s just going to be thrown away. Instead, recycle Christmas cards to make wrapping paper. Just remember not to send someone a present wrapped in the Christmas card they sent you! Being the classy lady that I am, I’m a fan of all things toilet rolls. In all seriousness, though, I’m thoroughly charmed by this Toilet Roll Yule Log Ornament. You’ve got toilet rolls constantly making their way to the trash can, so why not give them a little play during Christmas? 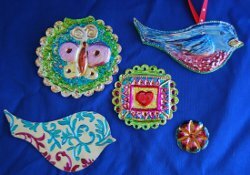 DIY ornaments are a great way to recycle during the holidays. These Tin Work Ornaments involve a different media than our DIY ornaments above. 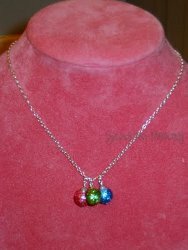 Learn how to make ornaments out of aluminum or tin cans that look store-bought. 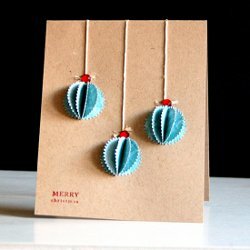 These are beautiful and can easily be Christmas crafts for kids too. 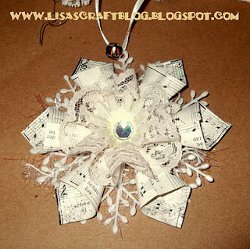 If you have old music sheets around your house, you can use them for this Paper and Lace Snowflake Ornament. I love the way this snowy ornament looks against pine needles. Keep it in mind as you prepare for Christmas. 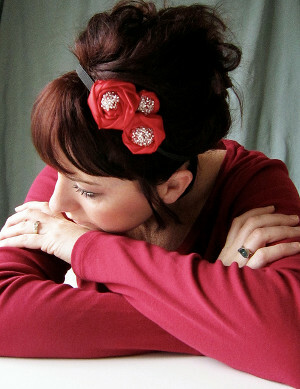 You can also check out this easy sewing project while considering homemade Christmas gifts. Stenciled T-Shirt Sleeve Pouches are the definition of handmade Christmas gifts. They’re super cute and useful too. This Upcycled Wine Vase is a great DIY Christmas present for friends who are fans of vino. The wine bottle shape is beautiful and can add a stunning decorative element to any home decor. Keep these ideas in mind as Earth Day approaches. Remember, too, that these are just the tip of the iceberg as far as recycled Christmas crafts go. 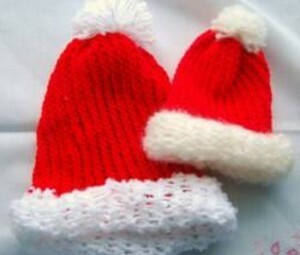 Our site is full of tons of Christmas crafts for you to explore and enjoy. When do you start Christmas crafting? The holidays are meant to be spent with the ones you love the most, not dashing from store to store trying to beat the Christmas rush. 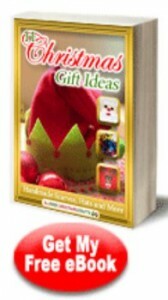 All of us at AllFreeChristmasCrafts.com want to help you make your holidays as relaxing and fun as possible, so we’ve found a few ideas that we believe will help you bring your family together without stressing. All you need to do is download our latest free eBook, A Very Homemade Christmas: 13 Craft Ideas and Breakfast Casserole Recipes for the Family, which has full tutorials, patterns, and recipes that everyone in your home can help with. Our latest eBook has Christmas craft projects that transform your craft fabrics and household materials into brand new handmade Christmas decorations. Not only is there the benefit of spending less on Christmas decorations, but there’s also the benefit of getting to spend quality time with your family and show them how fun and creative crafting can be. A Very Homemade Christmas isn’t just made up of crafts for adults, but also projects that your kids will have no trouble with. There are also 5 mouthwatering recipes for breakfast casseroles courtesy of AllFreeCasseroleRecipes that are just perfect for a cold winter’s morning. 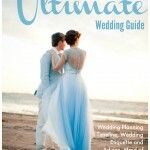 No matter what room you’re decorating for or what kind of activity you’re looking for to entertain you’re family, this eBook will provide something unique and easy. 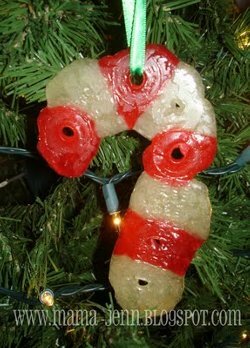 Life Saver Candy Cane Christmas Ornament – This is one of the most creative crafts within the eBook, and kids will absolutely love trying it. 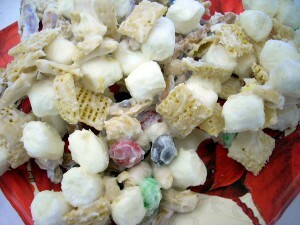 Learn a totally safe way to make homemade Christmas ornaments using only candy pieces. Once you learn how to get the shape just right, you and the family can try to make your own designs. They may not always come out right, but you’re guaranteed to have fun either way. This is an inexpensive option that’s also going to last for several years (and it’ll smell so good!). If your kids are just starting out with crafts, this project is a great way to show them how fun, fast, and easy it can be. 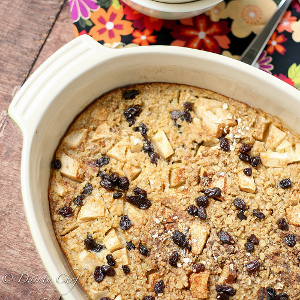 Apple Cinnamon Raisin Oatmeal – Take a break from crafting and indulge in one of 5 totally tasty breakfast casserole recipes. Start the day with a healthy, but flavorful meal like this homemade oatmeal. Follow the full recipe provided in the eBook, and in no time, you’ll have a nutritious, aromatic way to wake up the family. You don’t have to be a cook to make quick and easy meals that taste great. You may even find yourself wanting to try and make more once you’ve given it a go with one of the casserole recipes in the eBook! 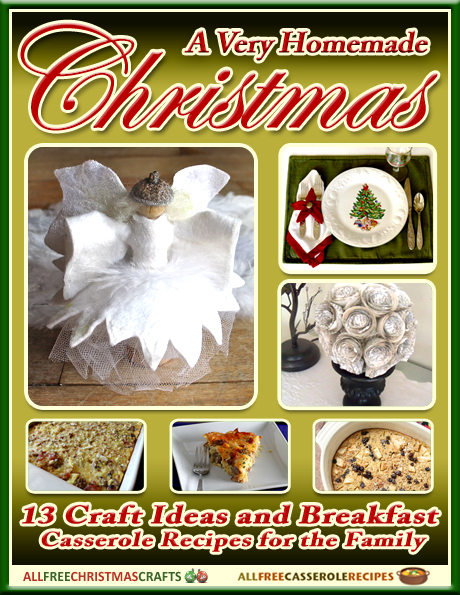 Download a copy of A Very Homemade Christmas: 13 Craft Ideas and Breakfast Casseroles for the Family – it’s free!